This morning I got an email from JetBlue advertising another one of their $44 sales. I did a quick price check on their website because I'm forever checking for low fares to Phoenix. (Which Jetblue almost never offers...) I was pleased to see a deal for $99 one way between JFK to Turks & Caicos. I put out a quick announcement on facebook page and was surprised to get a few responses. Then I started daydreaming... "Hmm... how much would a trip like this cost?" I already know from working with previous clients, travel to T&C is NOT cheap. It is a luxury destination. 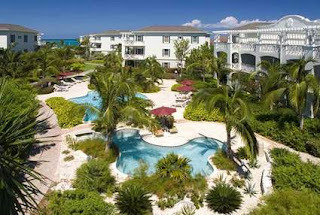 I did some hotel searching and found Beaches Turks and Caicos, which is all inclusive wanted close to $2k for 4 nights. That's a bit steep for a sista. So I'm guessing I can't do the all inclusive thang without shelling some dough that could go towards my shoe collection. The rooms comes with a small kitchen and fridge. Reviews mentioned there is a pastry shop down the road from the hotel as well as a grocery store. I could keep cost low by eating breakfast & lunch in my room and just spend funds dining out for dinner. Turks being a chill island, there isn't much to do in way of excursions and night life. (Unless I stay at the all-inclusive resort, then my options expand) Which is just fine by me. The resort is home to the fabulous Grace Beach, which I hear is top notch. I'm content chilling by the beach all day and watching Indian soap operas at night. This kind of trip requires me to bring a low maintenance traveler with me. I can't deal with someone who is restless and wants to be on to go. Not for T&C. $750 for 4 days on a fabulous island.....is possible. Very much possible with some flexibility and a disciplined budget. Sawwweeeet. I love that you went through the reality of the entire trip down to the cents. If you can responsibly afford it, go for it! Maybe opt for a place that's not all inclusive? Sometimes you end up saving a lot of money that way and still have a great time! Keep us posted!